Senior Russian lawmaker praised BRICS partners for their stand on the Crimean issue and believes that cooperation within the grouping is likely to grow. 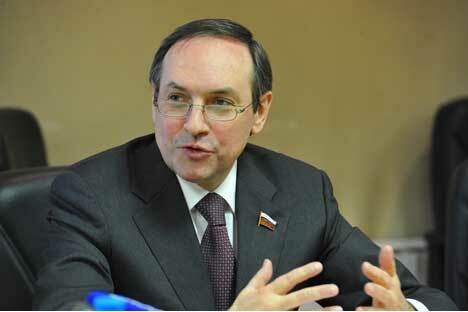 Cooperation within BRICS is now the overriding, central geopolitical format for Russia, Chairman of the Russian National Committee for BRICS Studies, State Duma deputy Vyacheslav Nikonov said in an interview with Itar-Tass. The BRICS summit scheduled for July in Brazil will ponder upon more than 20 cooperation formats which are now under consideration in ministries, institutions and think tanks of the member countries. “The recent refusal of the major settlement systems Visa and Mastercard to service cards of several Russian banks put Russia and other BRICS countries face to face with a need to put into practice the idea of a joint Bank of Development and a Stabilization fund for mutual settlements in national currencies and establish national settlement systems,” Nikonov added. “Russia’s course to turn BRICS into a respected international organization is serious and long-haul. BRICS is not a binding structure, it does not encroach upon anyone’s sovereignty. It is nothing like the European Union, whose headquarters in Brussels take away most part of the member countries’ sovereignty. BRICS is not planning any supranational bodies to which imperative rights would be delegated. BRICS is the 21st century cooperation format and by no means a hierarchical organization,” the MP said. “There is no place for a single centre of influence in the modern world. The idea of a multipolar world was actively promoted in geopolitical polemics in the 90s when the world had just dropped the bipolar system and some hotheads declared it was time to have the only center to decide in international affairs - the USA,” Nikonov added.